Pneumadyne’s durable, precision-machined 8-station brass pneumatic manifolds provide a handy and easy-to-use junction point for distributing liquids and gases to multiple lines from one input. 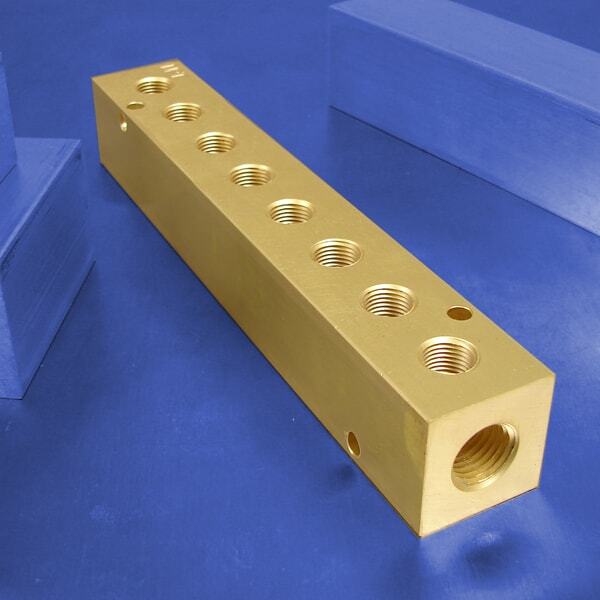 These manifolds are pressure rated to 2,000 psi, and are suitable for use with air, water, and hydraulic oil. Manufactured from corrosion- and chemical-resistant brass, these 8-station pneumatic manifolds will provide years of dependable performance. Featuring threaded ports for fast, easy connections to your implements and two sets of mounting holes for installation convenience. Available in 1/4 NPT and 3/8 NPT input sizes. Order brass 7-station pneumatic manifolds today, or contact Pneumadyne for more information.